In certain business scenarios Barion is able to facilitate payments between users of the system. Hence the name C2C, meaning consumer to consumer. There are roles, as indicated on the diagram. 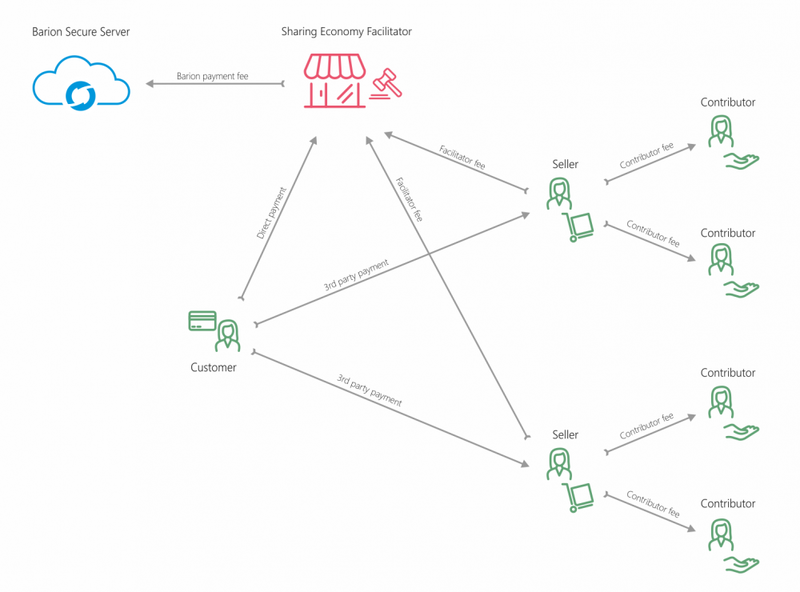 The Customer is the user who uses the services of Seller (or multiple Sellers in case of marketplaces) and pays the Seller directly. 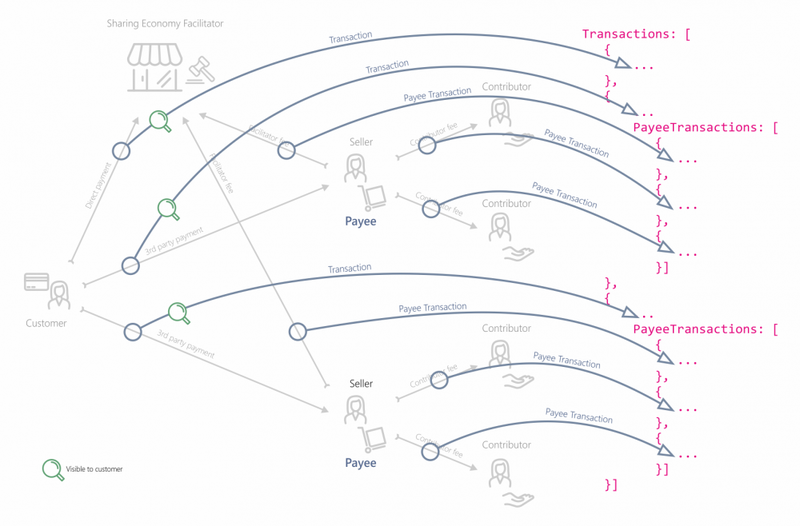 The Facilitator, the company that facilitates the service is organizing the payment with the Barion API. The Facilitator is able to transfer a fee from each payment to herself and to one or more Contributors. The Customer does not need a Barion account, but the Seller and Contributors do. Barion transaction fees are always covered by the Facilitator, no other parties pay transaction fees. The Facilitator has the option to control the payment of the Customer to Seller, by placing the sum in an escrow and decide about fulfillment at a later time, such as when the delivery is confirmed. The funds can be partially or completely refunded to the Customer in case Seller does not deliver properly. For further details about escrow please check out Payments with reservation / escrow. For further details about C2C payments please check out Marketplace, sharing economy, and facilitated payments. If "Uber" was using Barion, the passenger would be the Customer, and the Driver would be the Seller. "Uber" would ask for a fee from the driver, as the blue lines indicate. Barion transaction fees would be payed by "Uber". Drivers would need a Barion account set up before the first ride. Automatic charging would be solved by Token payments. 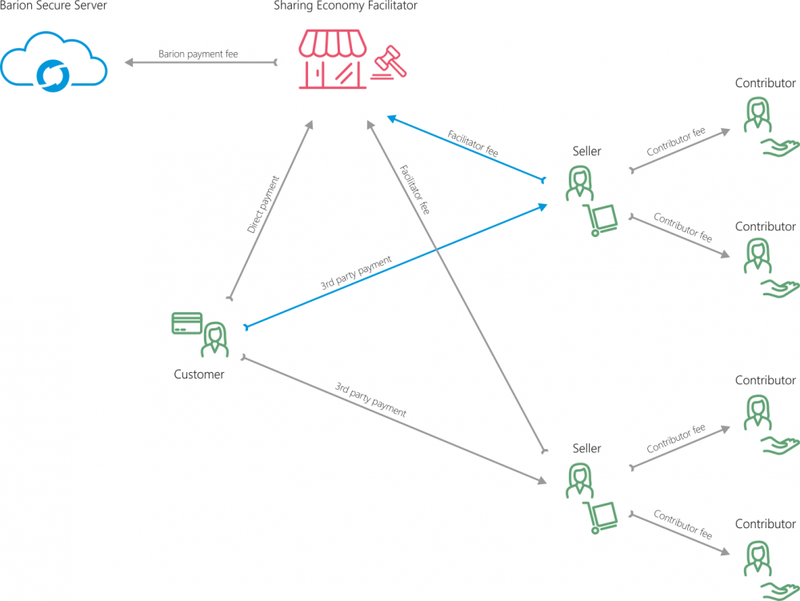 This example shows a marketplace, where multiple Sellers sell goods or services to the Customer, and both the Facilitator and third party agents receive a fee. Please check out the detailed example of a marketplace payment page for more informations. The following diagram helps developers match the C2C payment structure the the API Json structure. This page was last edited on 19 January 2018, at 09:46.